Rand Fishkin goes by the ludicrous title, Wizard of Moz. He’s founder and former CEO of SEO software startup Moz, host of Whiteboard Friday, co-author of a pair of books on SEO, co-founder of Inbound.org, and serves on the board of the presentation software firm Haiku Deck. Rand’s currently writing a book for Penguin/Random House on the ups and downs of startup culture, Lost and Founder, due out in 2018. If you want your business to survive, you must have empathy. Behind every business is a human being trying to get by, each with his or her own problems. Even though you may not be able to relate to all of your customers’ problems, the ability to understand their situations can be the deciding factor in creating a lifelong client. 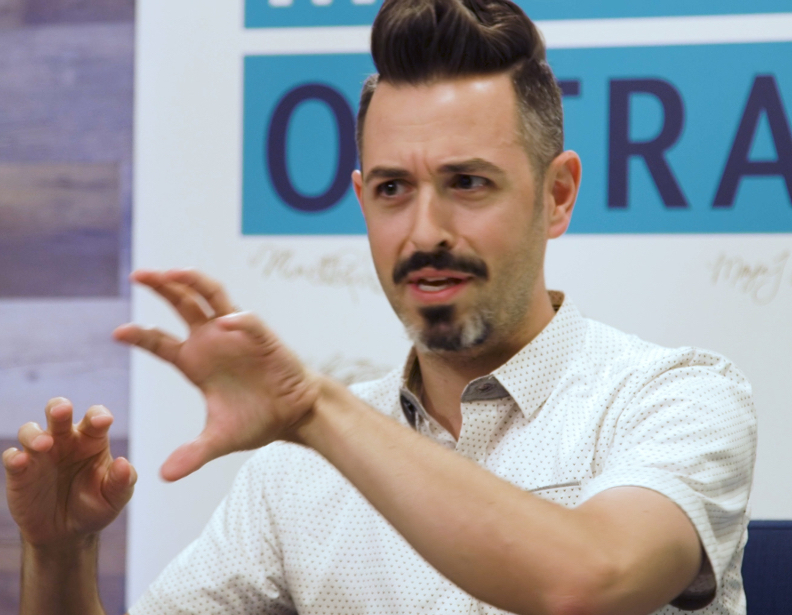 MODERN ONTRAPRENEUR had the privilege to sit down with Rand Fishkin to discuss how empathy helped shape Moz, Rand’s legacy at Moz now that he is leaving, and much more. Rand’s new book dispels myths about creating a business in Silicon Valley. With his exit from Moz in sight, Rand touches on what he hopes his legacy will be. For a lot of founders and CEOs, you may start out, you know, very empathetic and very humble, but over time there is a dangerous seduction that power brings with it. LR Welcome to Modern Ontrapreneur. 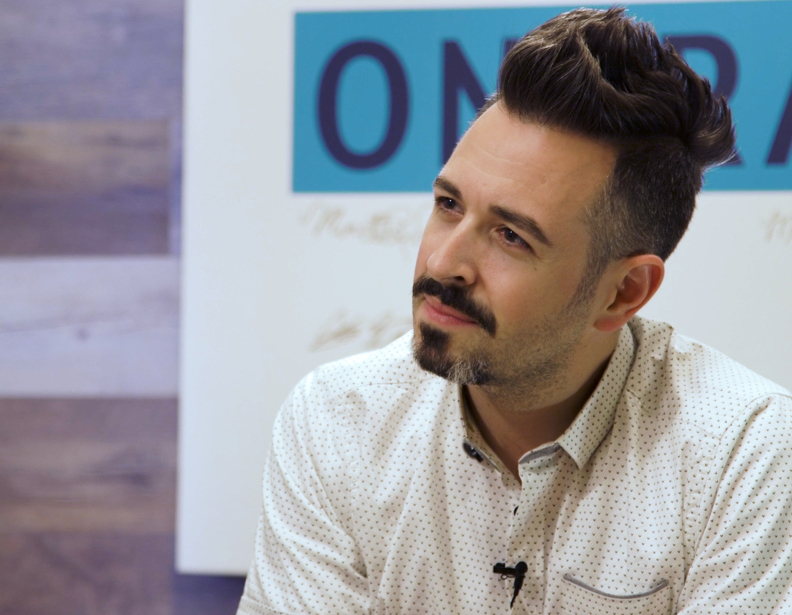 I am Landon Ray, and today I have Rand Fishkin, who goes by the ludicrous title The Wizard of Moz. He’s the founder and former CEO of SEO Software Startup Moz, host of the famous Whiteboard Friday (which I watched years and years ago), co-author of a pair of books on SEO, co-founder of inbound.org, and serves on the board of the Presentation Software Firm Haiku Deck. Rand’s currently writing a book for Penguin Random House on the ups and downs of startup culture, due out in 2018. In his minuscule spare time, he loves to travel with his wife, author Geraldine DeRuiter. Read about their adventures in her books and blog. Geraldine and Rand are also small investors in Backstage Capital and TechServe Seattle. Awesome. It’s so good to have you here. RF Yeah man. Great to be here. LR I really appreciate it. RF Thank you for having me. LR Just before we started rolling, you were telling me about some of the ups and downs of this thing. You’re actually writing a book about it. What is the book gonna be about? RF The book’s called Lost and Founder. RF Naming convention, yeah. I mean, you know this well, right? That I think Silicon Valley startup culture has biased a lot of us in the entrepreneurial world, to think and act in a certain way. And many of those are not actually in our interests or our company’s best interest. Some of the advice is just too surface level, and it doesn’t go into the depths. Some of it is misleading. Some of it only applies if you are a multi-hundred million dollar venture backed business. Some of it really only applies if your goal is primarily funding and not actually customer traction. I’m trying to dispel a few of those myths, and do it the most painful possible way, which is telling my own stories of how we’ve made those mistakes over the years and, despite that, built a reasonably successful business. LR Interesting. What do your investors think about you writing a book about how wrong they are? RF Well. Let’s see, I don’t think I’m going to put on the jacket, “This is a book about how wrong my investors are.” No, I think it biases all of us. And I would say that our investors ‒ Michelle Goldberg, who’s from Ignition in Seattle and Brad Feld, who’s pretty well known. He’s from Foundry ‒ are both very comfortable with my transparency and always have been. And I think that’s the only reason they signed up. There were lots of investors that I pitched over the years who were like, “Great business, I don’t want to read about myself on your blog, Rand.” Seriously, literally those conversations. LR Yeah. We’ve all seen some of those blog posts you’re talking about. I can imagine they were wise to be wary. If you could go back. You’ve been doing this for a while now right? LR You said. You were just saying, that it took off right out of the gate, which was about 2007? RF Yeah. So 07 is when we switched from being a consulting company to a software company. And for the first … For the next seven years, so 07 into 2014, we did have very rapid growth. Then growth has slowed the last three and a half years. But Moz is still growing. It’s profitable once again. But yeah, that rocket ship. It’s an overwhelming feeling. RF This was my first time, you know. I was a kid. I was what 26 when I started. LR Yeah. And just blew up. LR Yeah, amazing. How long were you doing the consulting thing? I remember when you guys were just consulting for sure. ‘Cause we were starting up. We started in 2004, then focused on the software in 2006. LR Yeah. If you could go back and give that early guy, you know wherever you’re thinking, like you know 2007, 2001 you know, a bit of advice from wise old now man. RF Got the white hairs. Yeah, yeah. RF Served my eight years. LR Yeah, served your eight years. What would that advice be? What would have made it easier, less painful, faster? RF One of the biggest ones for sure is, not getting distracted and excited about solving many different problems and, instead, choosing to exclusively focus on being the best in the world on one problem. I think I’m someone who naturally gets really excited by new challenges. I meet people, they tell me about a problem that they’re having in the marketing world, and I go, “Oh yeah, you know what, maybe I can solve that for you.” And unless the solution is “let me film a Whiteboard Friday that can walk you through that problem.” Right? If I go back to my team, and I randomize my 60, 70 engineers, whatever it is, on all these different tasks, you just don’t get the trajectory and the effort, and the brand that you need to be successful. I think in my next company, I promise I’m gonna try and stick to one thing. Just doing that really well. RF I love that analogy, ’cause I think that, that’s at the core of this focus problem is you randomize people, you start spreading those vectors, and now how can the ship move? LR Absolutely. What do you think has contributed to your success in terms of your personal skills or talents? RF Probably one of the things that has served me best over my career, is empathy. Just, I feel other people’s pain very deeply. Sometimes to a concerning degree. Sometimes people who are close to me in my life, or even people who are not, when I hear about serious problems that they have … it really breaks my heart. But at the same time, I think that’s something that’s helped me to build a lot of wonderful relationships over the years, and to identify, and in some cases, solve or at least seek solutions, or help people with their problems. And that’s meant that I have a wonderful network. Professional and personal. It’s also meant that a lot of the problems that I solve, and Moz solves, whether that’s through software or through training or content or whatever it is, actually turns out to be really helpful. I think that, that’s a reason people say, “Oh Rand really helped me with this problem or this career,” because I really felt that pain too. LR I feel like it’s the thing that has us be able to see the world through the eyes of our market. You can really see the problems the way they’re seeing them. See how they’re struggling. Even be able to look at your marketing or your content through … ’cause we all get the curse of knowledge with our own stuff. To be able to go back and put yourself in the shoes of somebody who doesn’t have 20 years of experience doing what you’re doing, is crucial. Once you’ve lost that, it’s so easy to get out of touch. Especially in a digital world where we’re communicating kind of one way a lot of the time. LR Everyone wants to talk to you. RF Yeah. You start to believe that you are somehow more worthy than other human beings. That you deserve something else. And that your opinion shouldn’t be questioned anymore. And that is almost always where things fall apart. LR What is working well at Moz today? RF Tactically, as a Software as a Service business, I think one of the … one of the not so humble decisions that I made early on, was I didn’t want to have any friction or … to force any sort of gateways for people to get into our software product. For example, most Software as a Service businesses, you get to a page, you’re like, “Oh, this looks kind of interesting.” And then what is a button? To take a demo or schedule a demo, talk to one of our sales associates. LR Or, shoot, give me your credit card. Submit. RF Yeah. Well, give me your credit card. So the way we made it was, you can try for free. If you like it, you can sign up with a credit card, and you don’t have to schedule or talk to anybody. There’s never a human being that you’ll have to interact with. And I’m one of these people who … I hate getting phone calls. I despise … I’m scared of the phone. I know I need to call my grandparents more, I try to keep in touch with them, because they are not email or text people, right? But I think I went too far with that. One of the things that Moz is doing now, and has been doing the last couple of years, that Sarah Bird our current CEO put into place, is customer success and onboarding. So folks, pick up the phone, and they have a call, and walk people through the software. And it turns out people who … customers who sign up, who have a twenty to thirty minute phone call with an onboarding specialist, are something like … their lifetime value, or the number of months that they stay with Moz is something like six months longer than the people that don’t do that. LR Which is a lot. RF Which is crazy. That’s … A twenty-minute call. Are you kidding me? That produces a six month average retention increase? It just blows my mind. So one of the things I will take away for next time is, hey there’s still a lot of power in having real conversations with people. Having, building those connections. LR Yeah. We have the same thing in our business. Our calls are two hours. LR Well, it’s two one hour calls. We give them a bunch of time, and we help them actually get set up and stuff. But, yeah increases … We measure 90-day retention, so how many people make it through the first 90 days? Which we figure by then, if they’re with us for 90 days, they’ve implemented, they’re using it, and they stay for a long time after that. We focus on making sure they stay around for that first bit. Increases 90-day retention by 20% if they do that call, which is huge. RF That’s huge. I mean, what else can you do to increase your business by 20%. LR What are you working on now, in terms of what are you learning? What are your challenges? What are you trying to figure out? RF Among the internet web marketing nerds. LR Very well known. Among that weird crowd, who’s more well known than Rand Fishkin? You’ve got a lot people who know you, have been up to, you’ve contributed to businesses of all sorts for quite a long time now. Do you have a sense of big picture? What it is that you’re building. What would you like your legacy to be? RF For many, many years Moz’s mission and my mission were the same, which was help people do better marketing. I have been frustrated my whole adult career, probably even go back to childhood about the way marketing had been done. I really despise sales heavy, aggressive forms of marketing. I also strongly dislike a lot of poor quality advertising, that’s poorly targeted, that doesn’t resonate with its audience, and that distracts us from doing the rest of the things that we want to do in our lives. And it interrupts us rather than earning our business. So, that is … I think that’s a mission I’m going to stick with probably, at least for the next company, and maybe my whole career. That’s something that I think … It’s a small mission, but it’s one that I feel like I can actually tackle. LR Modern Ontrapreneur, we named it this because we’re trying to get at what the unique … this unique moment is all about. Things have changed so much, even just since we’ve been entrepreneurs, and we’re trying to figure out what are the opportunities that are unique to this moment? Late 2017 or early 2018. And maybe what are the responsibilities that come with being an entrepreneur today? RF I think that … one of the things that is … that feels like a big obligation for me, is to help the people that the, especially in technology, that the rest of the tech startup and entrepreneurial world has left behind. And I think that you and I are both familiar with the fact that being 30 to 40 something, white guys, on the West Coast of the United States, it’s real easy to get money. It’s real easy to hire people, it’s pretty easy to build a business. If the business fails, it’s easy to do it again. It’s just not a ton of barriers. My wife and I have both been very passionate about trying to help folks who are not in those situations. That includes folks that are not in the United States or in more suburban and rural communities in the US. It includes women entrepreneurs who have been mostly left behind in the startup and tech world. And founders of color who’ve been almost completely left behind. I think there’s something horrifying, a stat that I saw was from the Kapor Institute, it said that less than 1% of all funded … So Angel, Crowdfunded, VC, anything… startups have been started by people of color in the United States in the last ten years, which is horrifying. LR I feel like there’s more than 1% of people of color in the United States. RF Oh yeah. I mean, we’re talking about 40% or more. So, that is truly disturbing that this sort of massive swath of Americans, and then massive swath of the rest of the planet who’s not American, have also been left behind. For example, we’re investors in Backstage Capital. Backstage is based in Los Angeles. And Arlan Hamilton, who runs that fund, invests exclusively in women and founders of color. I’ve talked to a bunch of their portfolio companies. Well, a handful of their portfolio companies now. And it’s fascinating. They work in businesses and spaces that just never would have occurred to me. “Oh, I didn’t know that was a thing. That’s real exciting to hear about. Let me know how I can help.” And we’ll have a conversation. Usually about SEO. Mostly, “Oh yeah, I bet I can help you rank for that.” In fact, there’s not a lot of competition for that right now. So that’s been really cool and we’ve been pushing really hard on the TechServe organization to get more diverse with their founders, and with the companies that they back. And I think this is a … Yeah. This is a good time for that. There’s a lot of folks in the startup world who have passion around it, and who recognize that it’s a real problem, and who see the weird overlap. Yesterday’s BuzzFeed article with the, “Oh wait, Peter Thiel and Dan Leon, and all these other weird tech people were kind of feeding the like Breitbart, Alt-Right machine. Oh god, we thought we weren’t part of that at all.” You know? So, I think that there’s … Yeah, some good catalysts for change and for broadening. And I’ll be honest. I also believe very strongly that chances are good that those folks, as they … as these underrepresented folks get into technology and into startup, that they’ll make amazing companies that we would not have otherwise had. LR Yeah. Of course. Rand such a pleasure to have you here. Thank you so much. RF Landon, my pleasure. Of course man. LR Would you sign our wall? RF Oh my god. I would love to. LR Awesome, it’s right behind you.